Our erstwhile Treasurer keeps insisting that our economy is strong, that the budget growth forecasts are sound, that he roolly roolly will get that one year of budget surplus in 2012-13, and go back to sleep children, everything’s fine. Even Dear Leader Julia has been in on the act, trying to instill con-fidence … while flogging the dead horse called “carbon tax” to the public. Now, recently we brought your attention to the Macquarie Economic Research debunking of the Treasury department’s growth forecasts. That is, the assumptions underpinning the May budget “estimates” and “projections”. “Truly extraordinary” assumptions for “stratospheric” growth, were some of the bold words they used. In the RBA’s latest release Chart Pack, there is one single chart that tells you all you need to know about the Treasury assumptions of a neverending China-fuelled “boom” in investment in Australia – the quarry to the world. And what is that tell-all chart? 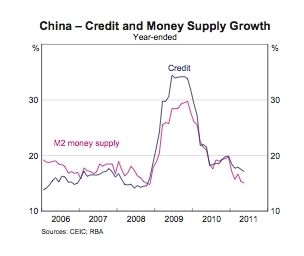 The credit-fuelled China boom is already over. It’s just a matter of time before reality hits. Ok then, here’s another. 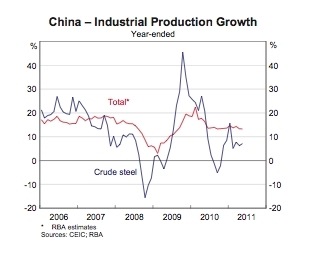 China’s industrial production. Is China producing as much steel? Or making as much crap, as it was pre-GFC? The key China trends are all down. As we have been pointing out here for quite a while. Lo and behold! Maybe Treasury is reading barnabyisright.com? Treasury has warned the Gillard government about emerging threats to the Chinese economy, which shielded Australia from the global recession and continues to underpin its resilience in the face of global economic weakness. 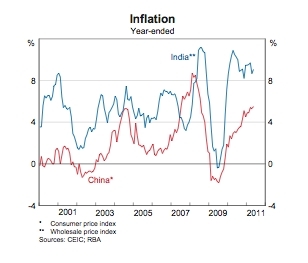 The warning about China’s runaway inflation, contained in a working paper posted on Treasury’s website yesterday, could have ramifications for Australia’s resources-rich economy, which is dependent on the highest terms of trade in 140 years. Although the paper is understood to have been prepared in May, the situation has worsened and China’s efforts to control inflation have become more urgent in the past two months. The warning on China came as the International Monetary Fund cautioned that the debt contagion in Europe could infect the global economy, and the nation’s largest supermarket operator, Woolworths, warned that the year ahead would be one of the company’s most challenging as Australians spent less and tried to save more. 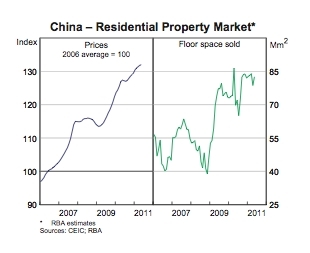 Did you notice that the chart on the right – “Floor space sold” – looks to have pretty much topped out? Hmmmm, what happens to a property bubble when the amount actually selling ceases to rise … anyone, anyone? And what did Wayne have to say about the warning from Treasury about China and Europe? The comments prompted the Treasurer to urge Europe to get its house in order.